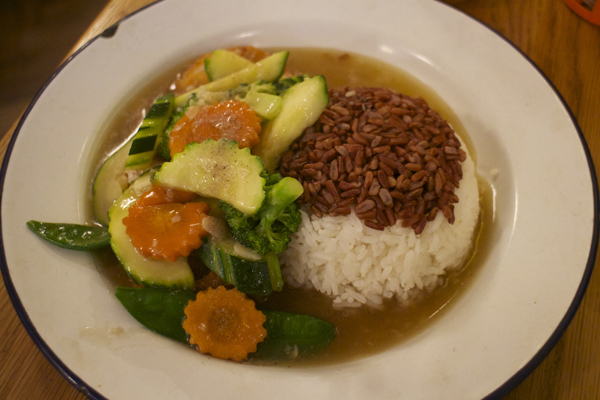 You may have spotted Rosa’s Café in the midst of Spitalfields and bustling streets of Brick Lane. Popular fish and chips restaurant Poppies is only a few doors away on Hanbury Street. Poppies draw big crowds, with people coming in and out for either takeaway or eating in. Rosa Café on the other hand is quiet and had only one table of diners when I visited. Rosa’s Spitalfields is their first baby in 2008, with five other branches in London. The colours used for the outside front a post box pillar red, with white writing, inside white walls and large wooden tables. You may wonder why a Thai place has an English name, the owner decided to keep the original café name that occupied the same spot. They wanted to create a modern twist to their traditional Thai dishes with the modern London food scene. Once inside, the lady greeted me but insisted I sit on spot in the dark corner, even though there was only one other table that was dining out of the place. I refused of course, as I needed good lighting for photos. The menu has a great selection of starters, rice, noodles, spaghetti, soup noodles and even wraps. A must have at Thai places is ice Thai Tea I can drink gallons of the stuff. 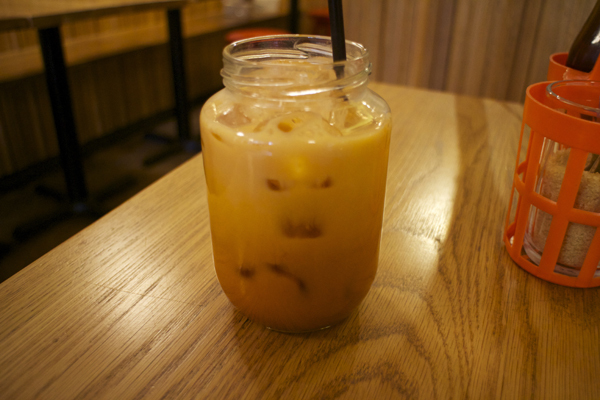 Tins of The Original Thai ice tea mix is filled by the bar. 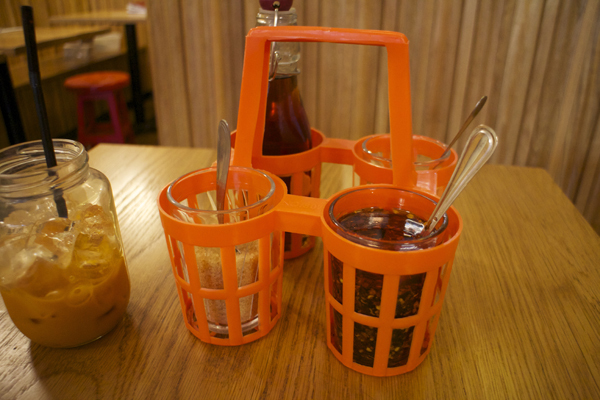 Table has one of those baskets you see in Thailand food stores with mixture of condiments. My food was prepared very quick, piping hot with steam letting loose on one of those tin plates. 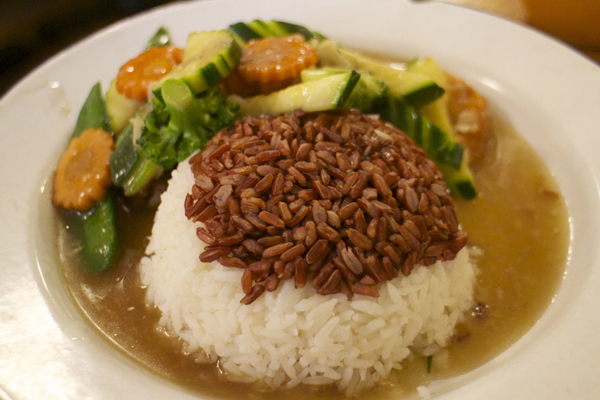 A rounded dome shape filled three-quarters of my plate with mainly the white rice and some brown. A nice mixture of chop vegetables, cucumbers, broccoli, cucumber and peas in the pods lay on top of my breaded chicken breast. The surrounding sauce is a very thin like broth gravy flavoured with plenty of salt and black ground pepper and oyster sauce. An interesting dish similar to Japanese katsu with a Thai twist. The prices at Rosa is not exactly cheap, but you can get decent home cook style food here.